Jurassic Coast specialist ammonite fossils including Polished and Natural specimens from Lyme Regis & Charmouth (as well as other places) on the Southwest coast of England. Perfect for gifts and interior design projects. 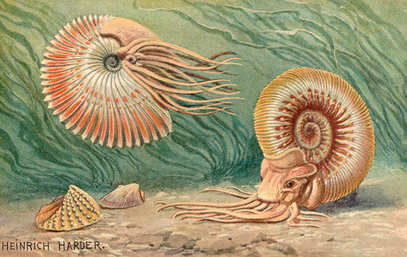 Ammonites from the Jurassic coast are typically 200 Million years old. This section includes Promicroceras planicosta ammonites, 200 Million Years Old. They are most commonly found at Black Ven, Lyme Regis, but have also been found in other Jurassic locations around the country. 200 Million years old, Black Ven, Lyme Regis. Size of ammonite: 1.8cm wide. Size of ammonite: 1.2cm wide with other partial and complete baby ammonites. Size of ammonite: 1.4cm wide. Possible predation mark - where the outer whorl is missing a chunk looks to have been bitten out. Size of ammonite: 1.4cm wide. Size of ammonite: 2.4cm wide. Size of ammonite: 1.5cm wide. Size of ammonite: 2.0cm wide. Size of ammonite: 1.7cm wide. 200 Million years old, Black Ven, Lyme Regis. Sat with the sun behind, you can see the ammonite rising from the sea of rock matrix. Size of ammonite: 2.5cm wide. This section includes Arnioceras semicostatum polished ammonite bed, Green ammonites from Golden Cap and Seatown, and a few others from time to time. These are classic Jurassic Ammonite species found in Dorset.